PHILADELPHIA (AP) Joel Embiid palmed a basketball he had just autographed high over his head and feigned like he would drop it to one of the kids that had circled the 7-footer on the court. With a victory celebration waiting in the locker room, Embiid, a noted soccer nut, took one step and punted the ball into the stands. He did far worse harm kicking the basketball life out of the Pistons. Embiid and Ben Simmons almost outproduced Detroit in the first half and sparked the 76ers to a mammoth lead even they couldn’t blow in a 114-78 romp on Friday night. Embiid had 23 points and nine rebounds. 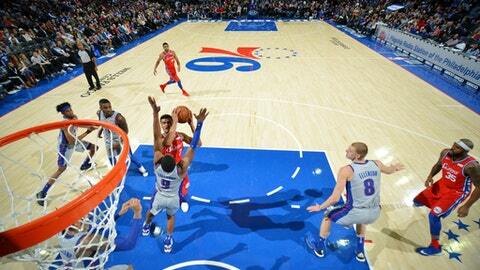 Simmons had 19 points and nine assists to lead the Sixers to their fourth straight win, which moved them back to .500. With 2 minutes left in the first half, Embiid and Simmons had combined for 26 points on 12-of-19 shooting. The Pistons had 26 points on 11-of-38 shooting. The 76ers have a nasty habit of blowing double-digit leads that crushed their push toward a more respectable spot in the standings. They wasted an 18-point lead in a loss to Portland. The Sixers turned a 22-point edge into a loss against Toronto. And they led by 16 points before Sacramento beat them. The Sixers opened the game on a 15-2 run and, unlike their December collapses, they never let this one get close. They led 97-61 through three. ”If you’re putting that roster on the floor, you’re doing everything you can possibly do to try to lose,” Van Gundy said. True. And that was the point of the method to tank seasons. While the Sixers have mostly collected duds in the first round of the draft (Jahlil Okafor, Michael Carter-Williams, Nerlens Noel) under their plan, Embiid and Simmons are the Powerball payoff for the franchise. Simmons, the No. 1 pick of the 2016 draft, did not attempt a 3-pointer and shot only one free throw. He didn’t need to do much more as he dominated in the paint. The 76ers sell ”Ben & Jo” shirts as part of the promotional push to earn them each their first All-Star berths. Simmons – who has no jump shot – backed defenders in the paint and spun around them for easy buckets. Embiid plowed his way to the rim and even buried a 3 in the second half. The move of the night? Hard to pick one when each play was more GIF-worthy than the last in the first half. Embiid made Dwight Buycks look like a JV player when he handled the ball at the top of the arc and used his left shoulder to knock back the guard two times before he tossed up a prayer and made the bucket. Simmons hustled toward a loose ball in the second quarter, ran a tightrope down the sideline as he tried to regain his footing and curved toward the baseline to throw down a two-handed dunk that sent the crowd into a frenzy. Simmons even flexed for the crowd, one more performance worthy of the Big Ben moniker that will surely be crowned on him next week when the Sixers play in London. ”I want to go out there and put on a show,” Embiid said. Pistons: At least no one was injured. 76ers: This game had the feel of a pep rally. Julius Erving rang the ceremonial Liberty Bell. Even with temps in the low teens, Sixers fans went nuts when they all won a free fast-food frozen dessert in the fourth. And ”E-A-G-L-E-S” chants rang out throughout the fourth quarter. Tobias Harris led the Pistons with 14 points. Langston Galloway, who starred at nearby Saint Joseph’s, scored 11 points. ”We never had even a good 2-minute stretch in the game,” Van Gundy said. Pistons: Host the Rockets on Saturday. 76ers: The Sixers play one game next week, Thursday against Boston at The O2. The Sixers leave Monday night.